Chris - And someone who is an expert on obesity is Professor Steve Bloom. Welcome to the Naked Scientists. Let's put some numbers on it first of all. How big a problem is obesity? Steve - About 80 excess deaths a day in the UK at the moment. That's an awful lot of people who are dying prematurely. It's a really serious condition. Chris - Linked to - what sorts of conditions are these people dying of? Steve - Well, mostly heart disease, stroke, diabetes but really the interesting thing that we found only recently is it virtually doubles your cancer rate. So it's rather more serious for cancer than cigarette smoking. Chris - Do you have any clue as to why it might do that? Steve - Well, for certain sorts of cancer, for example cancer or the uterus or breast, hormones get converted in fat tissue into something that's more deleterious for you. Actually several other types of cancer are affected which don't have any real reason. So we assume there's some sort of growth factor but actually don't know the details. All we do know is that if you do something about the obesity the cancer rates drop back again. It looks as if it really is the cause. Chris - Some people have suggested that because our body strives to maintain a constant body weight but if you take too many calories in it has to burn of some of the calorie excess. In the process of burning off some of the excess it could produce harmful chemicals, things like free radicals, which will damage your DNA and that could provoke cancer. Steve - People have been attempting to find something about free radicals for a very long time. So far it remains very theoretical. 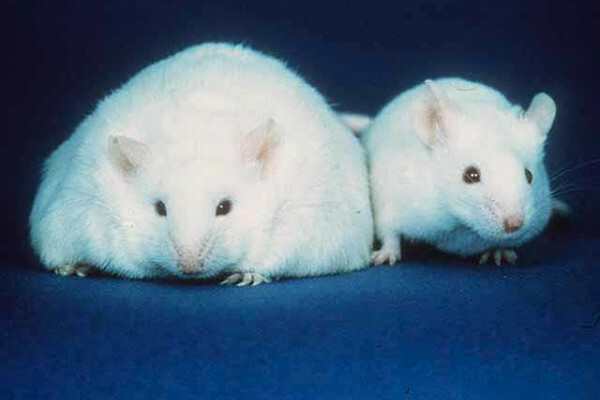 In fact, metabolic rate isn't very much affected by obesity. It turns out that in the UK we've been eating, if anything, slightly less but we've been taking a lot less exercise over the last 20 years. The reason for us getting fatter is that we have a mismatch between the amount we eat and the amount of exercise we take. We're actually eating slightly less. Chris - So why are we seeing these record levels of obesity? What's going on? Steve - Basically, you don't walk up the stair any more. You take the elevator. I was reading an old history book and someone living in London wanted to go to Brighton so he walked. Would anyone walk to Brighton today? Chris - Would anyone go to Brighton today? Just joking. Let's look at how appetite gets determined and controlled in the body. What do we now understand about what makes me want to put food into me and then stop eating when I'm full? Steve - It's completely normal to want to over eat. We're a species that survived endless famines and the people that lived through the famine were the people that put on extra weight when there was food around. You can think of it during the summer when there's a harvest or lots of game to catch; if you don't put on more weight you won't live through the lean winter. We're designed to get fat and the trouble is that the supermarkets are providing us with delicious food, high calorie food all the time, all through the year, yea- in and year-out. So we have relatively speaking too much food. As I say, we don't take enough exercise. Chris - As you say, our genes are dictating that we store this energy but how are our genes telling us to behave the way that we do, to over eat? Steve - That's just the way we're designed. If you didn't over eat when food was plentiful you died out in the next famine. We are the survivors of endless famine. We're the people that stole the last crust of bread. Actually, rather interestingly if you use up too much energy you also don't live. You could describe the human race as greedy and lazy. Chris - That's a pleasant thought, isn't it? One thing to point out, what about the fact that hormones must have a role to play in this? I feel full when I eat something. I can also detect changes in the levels of the blood of various chemicals. Tell us something about those. Steve - If we think of something like a vole or mouse or rat, if they don't get into their hole in a hurry they get eaten. We know that predation of small mammals - and we are evolved from small mammals that lived through the dinosaur era - predation increases as they get fat and they can't get away so fats. It's really important not to allow obesity to get out of control. So we do, indeed, have hormones which regulate our appetite. Our own research has been on the very simple question, why do you feel less hungry after eating lunch? Chris - What are you finding? Steve - Well, we're finding that the gut releases a lot of satiety-inducing hormones. So when you take food in the hormones are released from the gut, go round the circulation act on a central part of the brain called the hypothalamus where all the drives are located and decrease your desire to eat. This gives quite an interesting therapeutic possibility as you might imagine. Chris - But of course some people do eat too much and they weren't always fat. Why is it some people gain weight and other people seem to be able to eat whatever they like and they don't? Steve - If one assumes that our appetite level is set too high for modern society, what you might call the obesogenic environment with delicious food and no need for exercise then we're all following our natural genetic propensity to put on weight in this sort of environment. It's obvious that some people put on more weight than others. In fact, a tendency to put on more weight runs very markedly in families. If your parents were overweight, you tend to be overweight. If your parents were thin, you tend to be thin. This is true even if you're an orphan and brought up in another household. If your parents are thin but you're brought up in a fat person household you still stay thin. Genes are very important. They're the add-on to the obesogenic environment. What they do is they allow you to deal with an obesogenic environment or otherwise. One of the most interesting things about the human race is our tremendous variability. It was clearly an advantage that some people were good at firing arrows and other people were good at cooking and looking after the children. It seems that some of us are good at surviving famines and others of us are thin and lithe and able to fight off the enemy. A successful tribe has representatives of both. Chris - It's a bit like ant colonies where one of the ants acts as a living larder where all the other ants feed it and it becomes stuffed with sugar. During the hard times it disgorges some of this sugar and keeps the other ants alive again. Let's focus on the hormones that are doing this because that's probably the area of most interest. What mediators of appetite do we know about now? Steve - If I just step back and say we have no very good treatments for obesity, no medicines you can take that'll destroy your appetite. There is one procedure that really works and gets fat people to be thin for the next twenty years and that's bypass surgery which bypasses the upper gut. Basically, what that does is it fools the gut into thinking something's wrong. It's eaten a lot of food when actually hasn't and it then releases a lot of these hormones. We can measure them and show that they're very high. This successful surgical procedure works by chronically increasing the release of the satiety hormones from the gut. The trouble with the surgery is it's got a 1/30 death rate and it's really quite expensive and pretty arduous. On the whole I'd rather not go in for the surgery if I had an option. The objective of our research is to isolate these hormones, purify them, make them long-acting and then make them available as some sort of therapeutic administration to chronically restrain people's appetites as if they had something wrong with their gut so they don't feel hungry all the time. Chris - And have you got any molecules that show promise in this direction yet? Steve - yes, we've got several. We successfully set up a spin-out company which developed one and began to administer it in humans and has now been adopted by a large pharmaceutical company as one of their leading products in the field of obesity. That's likely to go on. Meanwhile my laboratory is working on several more. There's not just one hormone, there's about four of them. The body normally works by releasing several. This is probably an important safety feature so that if you get a parasite in your gut it can't fool your gut into losing its appetite spuriously because you need to have more that one hormone for the effect. This makes it a little difficult to develop a successful therapy but we think we've done it now, actually. Previous Does methane on Mars mean life?